For the Australian soccer coach, see Stephen Roche (coach). For Irish footballer, see Stephen Roche (footballer). Stephen Roche (/ˈroʊtʃ/; born 28 November 1959) is an Irish former professional road racing cyclist. In a 13-year professional career, he peaked in 1987, becoming the second of only two cyclists to win the Triple Crown of victories in the Tour de France and the Giro d'Italia general classification, plus the World road race championship, the first was Eddy Merckx. Roche's rise coincided with that of fellow Irishman Sean Kelly. Although one of the finest cyclists of his generation and admired for his pedalling style, he struggled with knee injuries and never contended in the Grand Tours post-1987. He had 58 professional career wins. All of these wins still stand, despite Roche having been accused by an Italian judge of taking EPO in the later part of his career. On completion of his apprenticeship as a machinist in a Dublin dairy and following a successful amateur career in Ireland with the "Orwell Wheelers" club coached by Noel O'Neill of Dundrum (which included winning the Irish Junior Championship in 1977 and the Rás Tailteann in 1979), Roche joined the Athletic Club de Boulogne-Billancourt amateur team in Paris to prepare for the 1980 Olympic games in Moscow. Soon after his arrival Roche won the amateur Paris–Roubaix, escaping with Dirk Demol and sprinting to victory on the track at Roubaix. Roche was told by his directeur sportif that if he did not win he "would be sent home to Ireland that day". He also finished on the podium at the early-season Paris–Ezy road race and finished 14th overall in the Sealink International stage race which was won by Bob Downs. However, a knee injury caused by a poorly fitted shoe plate led to a disappointing ride in Moscow, where he finished 45th. However, on return to France, August to October saw Roche win 19 races. That led to a contract with the Peugeot professional cycling team for 1981. Roche scored his first professional victory by beating Bernard Hinault in the Tour of Corsica. Less than a month later he won Paris–Nice (where he became the first, and still the only, new pro to win Paris–Nice) despite illness following the descent from Mont Ventoux and finished his debut season with victories in the Tour de Corse, Circuit d'Indre-et-Loire and Étoile des Espoirs races with a second place behind Hinault in the Grand Prix des Nations. In total, his debut yielded 10 victories. In 1982 his best performance was second in the Amstel Gold Race behind Jan Raas, but his rise continued in 1983 with victories in the Tour de Romandie, Grand Prix de Wallonie, Étoile des Espoirs and Paris–Bourges. In the 1983 Tour de France, Roche finished 13th and he finished the 1983 season with a bronze medal in the world cycling championship at Alterheim in Zurich. In 1984, riding for La Redoute following contractual wrangles with Peugeot (the settlement of which led Roche to sport Peugeot shorts for two years before winning a court action against Vélo Club de Paris Peugeot) he repeated his Tour de Romandie win, won Nice-Alassio, Subida a Arrate and was second in Paris–Nice. He finished 25th in that year's Tour de France. In 1985, Roche won the Critérium International, the Route du Sud and came second in Paris–Nice and third in Liège–Bastogne–Liège. In the 1985 Tour de France Roche won stage 18 to the Aubisque and finished on the podium in 3rd position, 4 minutes and 29 seconds behind winner Bernard Hinault. In 1986 at a six-day event with UK professional Tony Doyle at Paris-Bercy, Roche crashed at speed and damaged his right knee. This destroyed his 1986 season at new team Carrera–Inoxpran with little to show other than second in a stage of the Giro. Roche finished the 1986 Tour de France 48th, 1h 32m behind Greg LeMond, a Tour that Roche described as like "entering a dark tunnel" of pain. The injury and then associated back problems recurred throughout his career (for example in the 1989 Tour Roche abandoned after banging the problem knee on his handlebars) and a series of operations appeared to only address direct or consequential symptoms of the core injury. Later non-surgical intervention under Dr.Hans-Wilhelm Müller-Wohlfahrt in Munich made some difference but the injury required constant care. By the end of his career Roche was unable to compete at his best because of back problem which led to a loss of power in the left leg. In retirement he described riding the 1993 Tour de France "just for fun". He finished 13th, riding for Claudio Chiappucci). In 1987, Roche had a tremendous season. In the spring, he won the Volta a la Comunitat Valenciana, taking a third victory in the Tour de Romandie and fourth place plus a stage win in Paris–Nice. He also finished second in Liège–Bastogne–Liège, the closest he got to winning a professional 'Monument' Classic. He blamed it on tactical naiveté and "riding like an amateur". In the Giro d'Italia, Roche took three stage wins (including a team win with Carrera Jeans–Vagabond in the team time trial) en route to overall victory and became the first Giro victor from outside mainland Europe. Roche's stage wins that year in the Giro were stage 1b, the 8 km (5.0 mi) time trial downhill on the Poggio into San Remo and stage 22, a 32 km (20 mi) individual time trial into St. Vincent. Despite his stage wins, the race is remembered for the stage from Lido di Jesolo to Sappada, where Roche, contravening team orders, broke away alone early and despite being caught late in the race, had the strength to go with the counterattack and take the pink jersey from his teammate Roberto Visentini, who had been previously leading the classification. His behaviour in the stage gained him the tifosi's hatred. It was said the only member of his team that Roche could rely on not to ride against him was his domestique Eddy Schepers, although Roche recruited Panasonic riders and old ACBB teammates Robert Millar and Australian Phil Anderson to protect him with Schepers on the Marmolada climb (a day known as the "Marmolada Massacre"). Roche finished the Giro exhausted but favourite for the Tour de France. Following Bernard Hinault's retirement, Laurent Fignon's choppy form and with Greg LeMond injured following an accidental shooting while hunting, the 1987 Tour was open. It was also one of the most mountainous since the war, with 25 stages. Roche won the 87.5 km (54.4 mi) individual time trial stage 10 to Futuroscope and came second on stage 19. On the next stage, crossing the Galibier and Madeleine and finishing at La Plagne, Roche attacked early, was away for several hours but was caught on the last climb. His nearest rival Pedro Delgado then attacked. Despite being almost one-and-a-half minutes in arrears midway up the last climb, Roche pulled the deficit back to 4 seconds. Roche collapsed and lost consciousness and was given oxygen. When asked when revived if he was okay, he replied "Oui, mais pas de femme toute de suite" ("yes, but I am not ready for a woman straight away"). The yellow jersey (worn by the leader of the general classification) changed hands several times with Charly Mottet, Roche, Jean François Bernard and Delgado all wearing it before Roche used the final 35 km (22 mi) time trial to overturn a half-minute gap and win the Tour by 40 seconds, which was at the time the second-narrowest margin (in 1968 Jan Janssen had beaten Herman Van Springel by 38 seconds; two years after Roche's victory, Greg LeMond beat Laurent Fignon by 8 seconds). Roche became only the fifth cyclist in history to win the Tour and the Giro in the same year. He was also the only Irishman to win the Tour de France. Irish Taoiseach Charles Haughey joined Roche on the podium on the Champs-Élysées. Later that year, with victory at the World road race championship in Villach in Austria, Roche became only the second to win the Triple Crown of Cycling. Roche arrived with insufficient training although he worked during the 23-lap, 278 km (173 mi) undulating terrain for his teammate Sean Kelly and escaped in the race-winning break only while covering for his countryman. With Moreno Argentin in the following group, Kelly did not chase and as the break slowed and jostling for position began for a sprint, Roche attacked 500 m (1,600 ft) from the finish and crossed the line with metres to spare. Victory in the season-long Super Prestige Pernod International competition was assured. Roche was given the freedom of Dublin in late September 1987. Several days later the 1987 edition of the Nissan Classic began and Roche rode strongly to finish second behind Kelly. At the close of 1987, Roche moved to Fagor MBK, bringing English riders Sean Yates and Malcolm Elliot, 1984 Tour de France King of the Mountains winner Robert Millar and domestique Eddy Schepers. The team was criticised for containing too many English speakers. The 1988 season began badly with a recurrence of the knee injury and Roche began a gradual decline. In 1989 he again took second in Paris–Nice (making four second places) and the Setmana Catalana de Ciclisme. Roche finished the 1989 Giro d'Italia ninth behind Laurent Fignon. During the 1989 Tour de France, Roche withdrew due to his knee. There were problems with his team in and he changed again. In 1990, racing for Histor Sigma, he won the Four Days of Dunkirk and 1991 riding for Roger De Vlaeminck's TonTon Tapis brought victories in the Setmana Catalana de Ciclisme and Critérium International. In the 1991 Tour de France, Roche missed the start for his team's Team time trial and was forced to withdraw due to controversially missing the time cut. In the Grand Tours, he was ninth in the 1989 Giro, and won a stage of the 1992 Tour de France in appalling conditions into La Bourboule (again racing for Carrera Jeans–Vagabond but now in support of Claudio Chiappucci) and en route to a final ninth place. Riding the last edition of the Nissan Classic Tour of Ireland, Roche was in many breaks but finished fifth. A year later, he was again ninth in the 1993 Giro d'Italia and 13th in the 1993 Tour de France. Roche retired at the end of an anonymous 1993 which yielded a single win, in the post-Tour de France criterium at Chateau Chinon. "I have never taken performance-enhancing drugs whether banned or unbanned, on or off the list, at any time. In fact, I underwent hundreds of tests during my career and all were negative." In May 1990, Paul Kimmage – a former professional and teammate of Roche at Fagor, as well as a fellow Dubliner – published an account of life in the peloton. His book Rough Ride exposed drug use apparently endemic in the peloton but spoke in fawning terms about Roche. Despite this, publication resulted in a threat of litigation from Roche. It was reported in the Rome newspaper, La Repubblica, in January 2000 that Francesco Conconi, a professor at the University of Ferrara involved with administering erythropoietin (EPO) to riders on the Carrera team with which Roche had some of his best years, had provided riders including Roche with EPO. Roche denied the allegations. This was further reported in The Irish Times several days later, Roche again denying EPO. In March 2000 the Italian judge Franca Oliva published a report detailing the investigation into sports doctors including Conconi. This official judicial investigation unequivocally found that Roche was administered EPO in 1993, his last year in the peloton. Files from part of the investigation allegedly detail a number of aliases for Roche including Rocchi, Rossi, Rocca, Roncati, Righi and Rossini. In 2004 Judge Oliva again alleged that Roche had taken EPO during 1993 but due to the statute of limitations, neither Roche nor his teammates at Carrera would be prosecuted. "While it is a very hard and sometimes very cruel profession, my love for the bike remains as strong now as it was in the days when I first discovered it. I am convinced that long after I have stopped riding as a professional I will be riding my bicycle. I never want to abandon my bike. I see my grandfather, now in his seventies and riding around everywhere. To me that is beautiful. And the bike must always remain a part of my life." Roche lives in Antibes on the Côte d'Azur. Roche remained involved in the sport by founding cycling camps in Majorca, by taking part in race organisations and working as a commentator on cycling events for Eurosport. He has four children with his former wife Lydia; the couple divorced in 2004. One son, Nicolas Roche, is now a professional with BMC, and was the 2009 and 2016 Irish National Road Race Champion. Stephen's brother Lawrence Roche was also a professional cyclist who completed his only Tour de France in 1991. They were teammates on the Ton Ton Tapis team. Roche's nephew Dan Martin is also a professional cyclist and was the 2008 Irish National Road Race Champion. Roche completed the 2008 ING New York Marathon in a time of 4:21:09. Roche featured in a well-known Irish television advert for Galtee cheese in 1987, shortly after winning the Tour De France. ^ a b c d Stephen Roche and David Walsh (1988). The Agony and the Ecstasy: Stephen Roche's World of Cycling. ^ "Stephen Roche Olympic Results". Sports Reference. Retrieved 7 May 2015. ^ "La storia del Giro d'Italia". La Repubblica (in Italian). ^ a b c Doyle, Paul (5 July 2007). "Roche remembers his annus mirabilis". The Guardian. London. Retrieved 20 July 2007. ^ "Loserdom's guide to the 1987 Nissan Classic". Loserdomzine.com. Retrieved 16 October 2007. ^ "Tour Heads for home stretch". International Herald tribune. Archived from the original on 22 November 2006. Retrieved 16 October 2007. ^ "The last edition of the Nissan Classic". Loserdomzine.com. Retrieved 16 October 2007. ^ "Sport: Roche denies use of E.P.O." RTÉ.ie. 3 January 2000. Retrieved 11 April 2008. ^ "Cycling: Roche's name again to forefront in doping investigation". RTÉ.ie. Archived from the original on 30 August 2001. Retrieved 11 April 2008. ^ "Ufficio della procura antidoping del coni". sportpro.it. Archived from the original on 27 September 2007. Retrieved 20 July 2007. ^ Walsh, David (28 March 2004). "Sad end to Roche's road". The Times. London. Retrieved 20 July 2007. ^ "Roche's name again to forefront in doping investigation". rte.ie. 9 January 2000. Retrieved 20 July 2007. ^ "No.12 – Tour de France winner Stephen Roche denies allegations by an Italian judge of taking performance enhancing drugs". RTÉ.ie. Retrieved 11 April 2008. ^ "Stephen Roche". cyclingarchives. Retrieved 1 June 2015. ^ "Paris-Ezy (Fra)". memoire-du-cyclisme. Retrieved 10 June 2015. Roche, Stephen (2012). Born to Ride: The Autobiography of Stephen Roche. London: Random House. ISBN 978-0-224-09189-3. Retrieved 2 November 2013. Roche, Stephen (1987). My Road to Victory. Stanley Paul. ISBN 978-0-09-173738-2. Retrieved 2 November 2013. 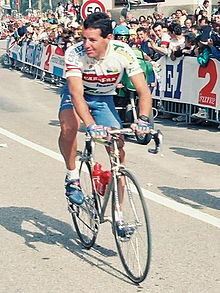 Wikimedia Commons has media related to Stephen Roche.